Winemakers have wrestled with how to store the sweet nectar for more than 5,000 years. Wine’s sensitive nature requires cool consistent temperatures, relatively high humidity, darkness and little vibration. Early European and Middle Eastern winemakers used the caves. Caverns and catacombs provided ideal conditions with temperatures in the mid-50s, humidity up to 75 percent, in a pitch-black setting. Optimal conditions ensure a slow but steady aging process. So the wine at your neighborhood retailer is not a static solution, but continues to evolve as it sits on the shelf for extended periods at room temperature. As a result, the modern wine drinker needs to protect his or her modest investment. The contemporary kitchen, resplendent with marble counters and stainless steel appliances, often also contains a wine rack. This trendy feature, although attractive, is a bad idea as kitchens create the warmest conditions and plenty of light. The cellarette — a mini fridge of sorts — is one option for storing wine in the kitchen. It can hold as little as a case of your favorites and is a good under-counter option. The market will always provide products to embrace every need, but why does the consumer need a wine cellar? 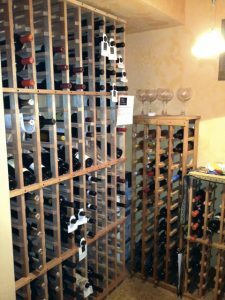 A cellar, whether a bedroom-sized temperature-controlled sealed environment or a cool corner in the basement, can happily house a case of your weekend favorites, or bottles best consumed in 2018. The vast majority of the wines currently on the market would not benefit from long-term cellaring, however wine tastes much better stored in the proper conditions. Think of a wine cellar as dark, humidified, temperature-controlled pantry. Your favorite cabernet goes on sale, buy a case and stick it in the pantry. Christmas is coming, so how about a bottle of something special. For those wishing to venture into wines of a higher stature, which benefit from a few years of aging, consult your local wine expert. Most vintners also have websites which include information regarding the shelf life of any current vintage. Any wine enthusiast going to this much trouble ought to make sure conditions remain consistent, and store bottles horizontally to keep the corks moist. Commercial wine racks come in every size, material and color. 2007 was a great year in California for Cabernet Sauvignon, Pinot Noir, and Zinfandel. Expect to dig deeper in the wallet, but the difference between a $15 dollar bottle and $30 properly cellared offering is considerable. The best advice is do the homework necessary to make a educated purchase. Lots of disappointing vintages still have lofty price tags.